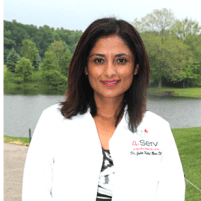 Dr. Julie Kalsi of Flawless Med Spa in Livonia, Michigan offers patients the most advanced skin rejuvenation treatments, including the new DermaFrac™ dermal fusion system. Dr. Kalsi’s expert DermaFrac treatments are known throughout Southeast Michigan for their ability to correct a wide range of skin flaws and create an overall youthful and refreshed appearance for both women and men. DermaFrac is a ground-breaking new skin rejuvenation system that combines multiple treatments in a single office procedure. Approved in 2015 by the FDA, DermaFrac treatments are tailored to each patient’s individual needs, are pain-free and do not require any downtime. This unique system is truly a game-changer. It pairs microdermabrasion, to exfoliate the outermost layer of dead skin cells, with microneedling/serum infusion. Microneedling is a pain-free technique in which thousands of microscopic channels are penetrated into the skin to stimulate collagen production, activate the skin’s own healing process and allow for the infusion of a custom-selected serum. Some patients choose to add LED therapy after the microneedling portion of their treatment. Red LED is used to correct erythema (superficial reddening of the skin), blue is used to remedy acne. LED therapy also provides a cooling fan to help recover from the microneedling. DermaFrac is tailored with each patient evaluated before receiving a customized plan. Sometimes, for example, microdermabrasion is not performed with the procedure. LED is optional, as well. What type of skin flaws can DermaFrac™ correct? DermaFrac is great for all skin types for getting rid of acne, brown spots and stretch marks, along with, other pigmentation issues. It also diminishes wrinkles and fine lines, acne scarring and enlarged pores. What happens during the DermaFrac™ treatment? A hand piece containing the micro-needle roller tip cap and a cartridge of the appropriate, pre-selected serum is gently moved across the skin. A vacuum lightly pulls the skin into contact with the micro-needles, which painlessly puncture the upper layer of skin, creating channels through which the serum is delivered. The depth of the needles is carefully calibrated so that the channels do not extend to capillaries or nerve endings. This ensures that the procedure is painless and that there is no bleeding. The entire treatment takes no more than 30 minutes and patients free to go about their regular daily activities immediately after.